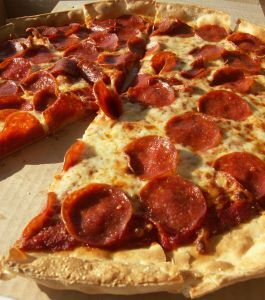 Check out GAYOT.com's list of the Top 10 Pizza Restaurants in the U.S. The man in the aisle seat and I were hoping that our middle seat would remain empty, but these days, few flights seem to have empty seats. It was filled by a young man carrying not one, but two pizzas. Hot pizzas, in bulky boxes that brushed against my side, as their aroma made my stomach wake up and take notice. Since a meal was not provided on the plane, I could see why someone would want to bring a taste of New York with them, but one large and one medium pie seemed like a lot for one person. Aisle seat man and I joked that it would cost him a slice each for him to sit with us, but the youngster informed us that he wasn’t going to eat his carry-on. His plan was to carry the pizzas back to his family. I discovered that he had never flown before traveling from LA to NY, and this was the return leg of his maiden voyage. He had no idea how strange it would be for someone to carry two pizza pies onto an airplane, and hold them for 5,000 miles at 30,000 feet on his lap for six hours. Nor what effect it would have on his seatmates in terms of obstructing the limited space we shared as well as the tantalizing smells. Since I review restaurants for a living, I had to ask him where he had gotten his precious cargo. I figured it had to be fantastic pizza for him to want to fly it across the country on his person. He said it was from a pizza place in Queens that he had never been to before, and he didn’t know the name. He had just picked up some pies there before heading to the airport, because his family wanted to try some New York pizza! My seatmate and I were able to convince him that he should hand his delicacies over to a flight attendant, who would return them to him when we landed. And I thought he should know where to go for the best pizzas the next time he planned on taking some into the friendly skies. Check out our top 10 pizza parlors in the U.S., and the best pizza near you. And what did that man delivering pizzas do for a living? Believe it or not, he actually worked for a delivery company!